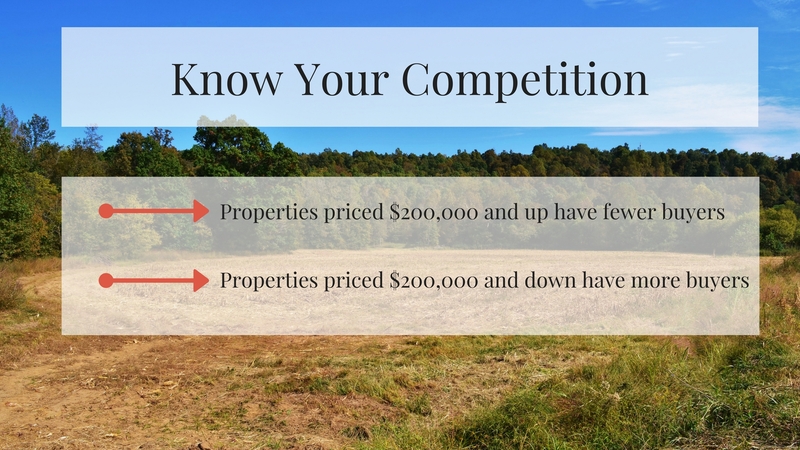 Land market trends are always evolving. Trends swing from favoring the buyer to favoring the seller and properties on the market are consistently changing. Here’s what you need to know about today’s current market and what buyers are looking for when they call me looking to buy. We’re between a buyers market and a sellers market. Buyers do not have the power they had from 2009-2011, but we’re not truly in a sellers market where they can just name their price. We’re in between. The cost for tillable ground has been up over the past few years because of commodity prices, but those prices have come down considerably so, as a result, the cost of tillable ground will either hold steady where it’s at, or it will drop. So, with that in mind, what are people looking to buy right now? They all pretty much want the same thing. A piece of property that is made up of 20%-40% of tillable ground and the other part timber. 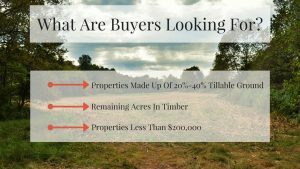 The thing is, buyers want something that creates a little income, whether that’s through crops or CRP. They want lots of fields that create lots of edges along the timber. That is what has always been and always will be the number one selling property on the market. 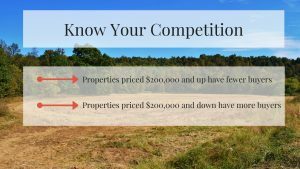 Of course price does play a role, so as you look at the land that’s on the market, keep in mind that property below $200,000 will have more buyers and be in higher demand than property listed for more than $200,000. That can play a role on how long that property might be available, too. Learn more. If you have property that fits this description, and are thinking about selling, feel free to give me a call or email me.If the pictures in this post caught your eye, it’s currently available! Click here, to learn more. To see all of my listings, click here.